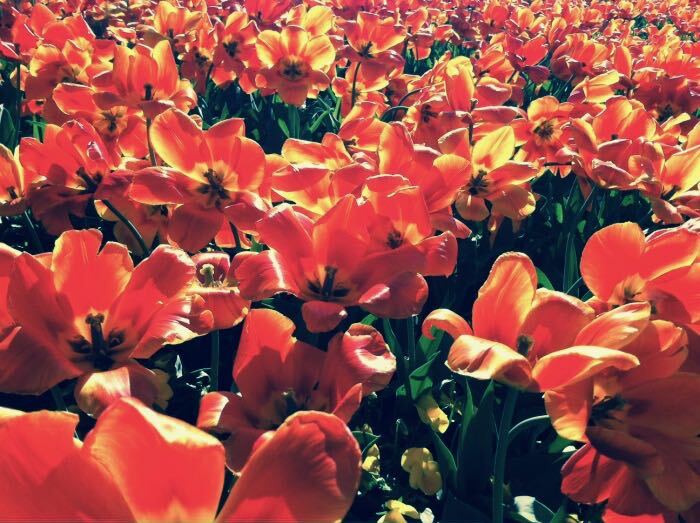 Tulips in the sun — a photo taken the week of the Boston Marathon bombing. In a media literacy class at the University of Maryland, College Park, students wrote of how they learned of the Boston Marathon bomb blasts on Monday, April 15, 2013. One week and one day after the bombing, students were asked to relate the story of how they heard the news. They were asked if media played a role in how they learned of the attack – and all the events that followed, including the Friday lockdown in the Boston metropolitan area and the final capture of the surviving suspect in Watertown, Massachusetts. To illustrate their stories, students were asked to upload a photo taken during that week. How do you remember the events of your life? Following a semester that included visits to the Newseum and the United States Holocaust Memorial Museum, media literacy college students were asked to write their own story of how they learned about the Boston Marathon bombing. The writing exercise asked the student to consider the importance of media records of events as well as the value of personal recollections of them. Working individually, students took an hour-long class period to write the story that they thought best described their encounter with the terrorist attack in Boston and – if they wanted – with other news events the same week: the explosion of a fertilizer plant in West Texas, a massacre outside Damascus, Syria, poisoned mail sent to the President and a US Senator, a 7.0 earthquake in Sichuan, China. The students who wrote the stories later visited this site in class (and gave their permission to have their stories told in public). They looked (again) at their own written reflections and compared then to the stories of their friends and peers. They discussed the shared ideas and issues that had emerged. They recognized patterns among the stories. The students told tales of fears and desperate hopes, of selfishness and selflessness, of prayers and of patriotism. “It was a very surreal feeling seeing the bombs explode, the people screaming and the blood on the ground. It was a different feeling than I felt when 9/11 happened because I was so young, only in the third grade when that happened. Now I am a twenty year old who can use television and the Internet to get more information of what occurs. …..Life is not easy for anyone; people are discriminated against every day in this country. As a Latino it is very hard to hear people talk about immigrants as not people but as animals who should be kept away with an electric fence like cattle. This angers me, though the thought of harming anyone has never come through my head. I want only to use my right to vote for bills that help the community – never to hurt it. How are the stories unique? What lessons can be shared? “I joined my roommate on the couch and we watched the news. …..As two foreigners, we had no family to call in Boston, no tweets to send to relatives. However we still took to Twitter and Facebook…. Our friends abroad kept calling us to ask if we were ok and at that point we could really feel the beauty of media and how it allowed us to share and connect with people in Boston and people in other countries. …..As we continued to watch the news, my roommate and I were amazed at the dedication/efforts the trauma health care teams and good citizens of the community expressed in helping the injured victims. My roommate and I had both lived in countries where communities aren’t friendly and people are selfish. The FULL WEBSITE, INCLUDING SCORES OF STORIES, IS AVAILABLE HERE.